A voice in the light woke her from a coma. But can the man pull her from the darkness of her life? Eva Anderson is trying to rebuild her life after a devastating accident. The first voice she hears when she awakes is actor Harry “Matthew” Lyell—A man she could love. But left in a wheelchair, she’s withdrawn into herself. Harry Lyell often wonders about the woman he met at the theatre door and then again, when she woke from a coma. Trusting in his faith in God, he knows there must be something special in Eva. 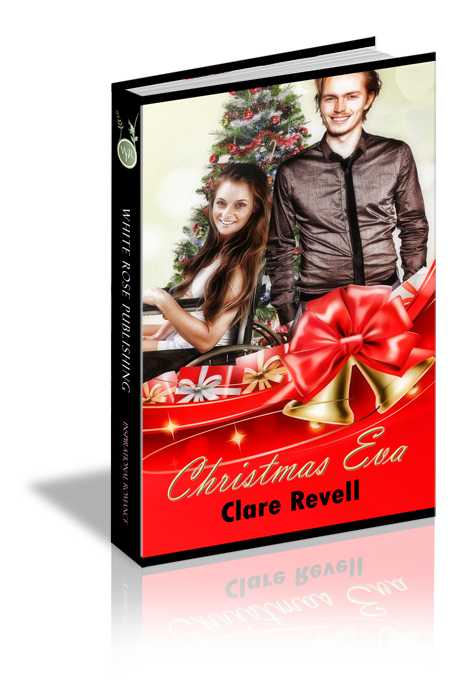 As Christmas approaches, Eva and Harry's lives are drawn together in a way neither imagines. Can Harry help Eva find the Christmas miracle she needs or will a simple article destroy any future they might have? “Good.” As they burst onto the street, Eva assessed the tall building with its domed roof and granite columns. A huge sign saying Full House sat by the revolving doors. Billboards advertising the play and the cast hung from overhead. The display casings on either side of the theatre steps held posters listing the name of the play and the cast. Her heart pounded faster as she read them, her gaze not getting any further than the lead actor’s names. The Tide Turns starring Bertram Williams, Hannah Daystrom, and Matthew Lyell. Matthew Lyell. The reason she was here on what was forecast to be the wettest night of the year so far. Eva climbed the remaining steps and entered the theatre lobby with Sue. Deep red carpets, dark brown woodwork, huge mirrors, gold lights and fittings all added to the opulence and rich ambience of the building. Eva felt underdressed, despite her full-length gown, suede jacket, and pearl necklace with matching earrings. Her sister, Felicity, had laughed at her attire. But Eva had merely pointed out that this was an evening show on London’s West End, and you didn’t simply turn up in jeans and a crop top. It had to be formal wear and nothing less than the best would do. Felicity had then resorted to teasing about Eva dressing up for her favorite actor, but Eva had ignored her. She bought a program and followed Sue inside the auditorium to find their seats. Front row, gallery, directly opposite the stage. Eva grinned back. “Yes, you can.” Of course, being in a theatre was nothing new to her. As a makeup artist she worked in one—or on a film set—almost every day. But front of house was a treat. A rare occasion to be treasured. She settled into her seat, her excitement mounting like a little kid on Christmas Eve. Eva sucked in a deep breath. “I guess we could try. So long as we don’t miss the last train home.” She looked back at the program. Matthew Lyell beamed up at her. His blue eyes, short brown hair, and strong jawline, set her heart pounding. Never mind the fact that Internet research told her he was single and a Christian. She mentally shook her head at herself. Felicity was right. You have a crush on the guy… But what would she say to him if she ever did meet him? Would she even be able to string three words together without sounding like a gibbering wreck or an idiot of the first degree? The music started, lights dimmed, and the curtain rose. And there he was. Her favorite actor, mere feet away. As the play progressed, she laughed and cried, all the while totally mesmerized by the fact he was on stage. Matthew Lyell brought the character to life so convincingly. Her heart fluttered and skipped beats almost rhythmically, while her stomach filled with butterflies. His voice thrilled her in the same way it did on the TV or in film. Too soon the play was over, and Sue was dragging her around the building to the stage door. Before she could murmur OK, the stage door opened, and two figures emerged, laughing. Eva’s heart skipped a beat. “I only have the one on my phone.” Eva looked at him. “I’d love one.” She fumbled in her bag and withdrew her phone. She pulled up the camera app on the fourth attempt, her trembling fingers not wanting to co-operate. “Allow me.” Mr. Lyell took the phone. “Same as mine.” He stood between the two girls and took selfies of them together and then took one with each of them alone. Eva didn’t even breathe as he slid his arm around her. She was sure she’d be smiling like a maniac. “Have you got far to go?” he asked, handing back her phone. “Not too far. Have a safe trip back.” He put his arm around the actress again and headed over to his waiting car. Sue nodded and together they ran the short distance to the tube entrance. The gates were locked. “The main entrance is in the next street.” Sue set off at a run towards the road. Eva followed, slogging through the deluge. Why had she worn such impractical shoes? Low heels—or no heels at all—would have been much better. It was still raining back in Headley Cross as they waited for the lights to change, before crossing to the taxi rank. Sue dragged her across the road. Then, a bright light approaching too fast blinded Eva. A screech of brakes hung in the air; a car horn blared. Darkness folded around her, cutting off a brief instance of pain. Harry Matthew Lyell pounded the treadmill in his front room, hymns blaring from the MP3 player around his neck. He hummed along, knowing he was out of tune, but not caring. After all, the Bible said make a joyful noise unto the Lord. It said nothing about it having to be tuneful. He glanced at the wall clock. 9AM—way too early, but a lie-in compared with a three-thirty wakeup call on a film set. Early mornings were a killer, but they did have the advantage of getting the necessary evil of keeping his body in trim out of the way. The phone resting on the front of the treadmill lit up—the display indicated his agent was calling. “Cool. I’ll be there. Did you hear back from the director of Long Beach?” He’d auditioned for the film over a month ago now. He’d gotten the part, but the writer had mentioned some added scenes, so he’d had Frank look into it before signing a contract. “Go on.” Harry didn’t let up running, watching the screen in front of him. Harry stopped running. What was the name of that girl who’d stood in the rain waiting for him that night? He’d been unable to get her image out of his mind ever since.